Home / Blog / Rashies have Landed in Support of SAFE INC! Rashies have Landed in Support of SAFE INC! I was on a mission! I could not find a rashie anywhere offering high visibility for safety on the water. So here they are! Finally landed in Perth! There are limited stocks so place your order for one of these really cool rashies at only $55.00 now in stock! Colours: Green, Pink, Grey, Yellow and blue. Colours are true to picture. To order please go the the packages link and submit an enquiry via the contact form stating your size and colour preference. Alternatively come on down to PUPS on SUPS on Saturday mornings at Sandy Beach Reserve, Bassendean where you can check out sizes, colours and fit! Support a worthy cause and enjoy a quality product with emphasis on water safety, UV protection and comfort! 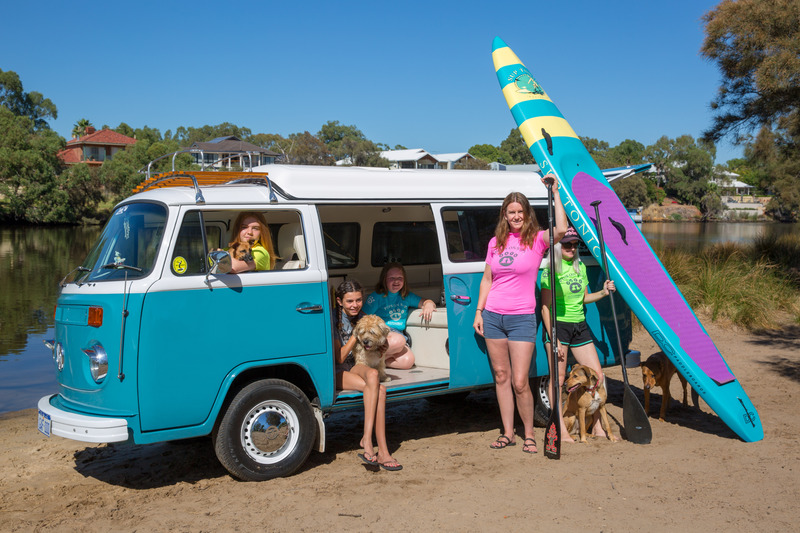 A BIG thanks to Veronica McPhail for the amazing pics, the groovy “Goboat” crew turned “SUP” chicks for a day who modelled the rashies and John Cooper who donated the Kombi. John’s dogs (pictured) are rescue dogs from SAFE INC and I think we have captured the SUP Tonic vibe perfectly. Simple and carefree but with an important goal to support the rescue of animals, buy recycled products and make a difference to the community in some small way. If you haven’t already – come down to PUPS on SUPS for a fun Saturday morning or just spectate and donate a gold coin to SAFE INC to support the amazing work they do through their adoption and re-homing services! It all helps in whatever way we can contribute and thanks for being part of the SUP Tonic family!